I'm sad these guys are not more famous, because I feel like Will Ferrell would do an excellent job impersonating them. It would also have to be 1999 in order for SNL to possess Will Ferrell, so there are a lot of elements to this wish that are unrealistic. O well. In "High" the Australian duo known as Peking Duck churn out more "electronic w a casual bass drop" vibes. Pretty similar to Flume. Nicole Millar proves to be an excellent partner for these clowns. 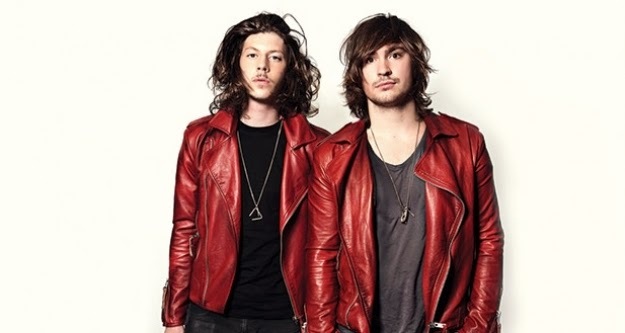 (I'm sorry but if you wear matching red leather jackets that is what I am going to label you as). Her voice is well suited to their production: kind of growl-y and melancholy at the same time. This is also a weird thing to comment on, but I feel like there is a good singing to instrumental ratio happening here. Just when you miss Mz. Milla, she returns. Wrd.